Former Director of National Intelligence James Clapper admitted to congressional investigators that he spoke with CNN about the Trump dossier close to the time the outlet published a scoop, according to a House Intelligence Committee report released Friday. The report revealed that Clapper, during an interview with House Intelligence Committee investigators on July 17, 2017, first “flatly denied” that he had discussed with journalists the dossier or any other intelligence related to the 2016 election. But during that same interview, he later admitted discussing the dossier with CNN’s Jake Tapper and possibly other journalists. “Clapper’s discussion with Tapper took place in early January 2017, around the time [intelligence community] leaders briefed President Obama and President-elect Trump” on the dossier, the report said. CNN reported those briefings on January 10, 2017, prompting BuzzFeed to publish the dossier in full. 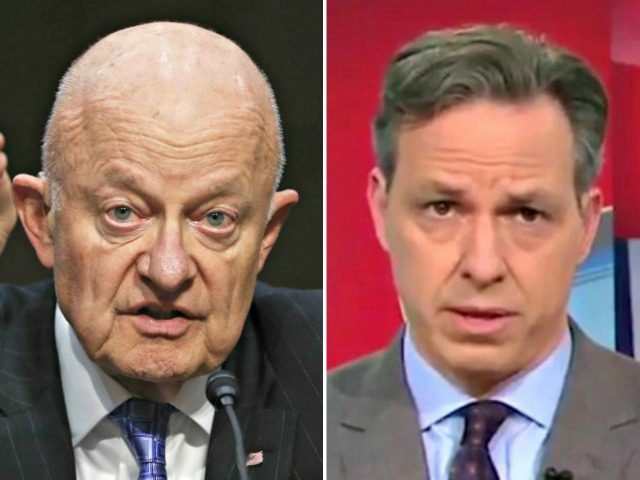 The confirmation that Clapper spoke to Tapper comes after recently published memos by former FBI Director James Comey revealed that at the time he briefed Trump on the dossier, he knew CNN was looking for a “news hook” in order to report on the dossier. Comey’s memos also revealed that Clapper was the one who asked him to brief Trump on the dossier — which subsequently became the “news hook” for which CNN was looking. The sequence of those events has raised questions about whether Clapper was attempting to set up the news hook CNN needed to publish the dossier. The report also found that Clapper had inaccurately publicly testified in May 2017 that the dossier was not “in any way used” in the assessment. The House Intelligence Community report also revealed that the dossier was, indeed, part of the intelligence community’s assessment of Russian interference and that Russia was trying to help Trump. A two-page summary of the dossier was added to the appendix of the assessment, the report said. The House Intelligence Committee’s report is the final product of its investigation, which lasted more than a year, into Russian meddling in the 2016 election and any potential collusion with a presidential campaign. The investigation, which involved interviews with 73 witnesses, nine hearings and briefings, and review of 307,900 documents, found no evidence of collusion between Russia and the Trump campaign.